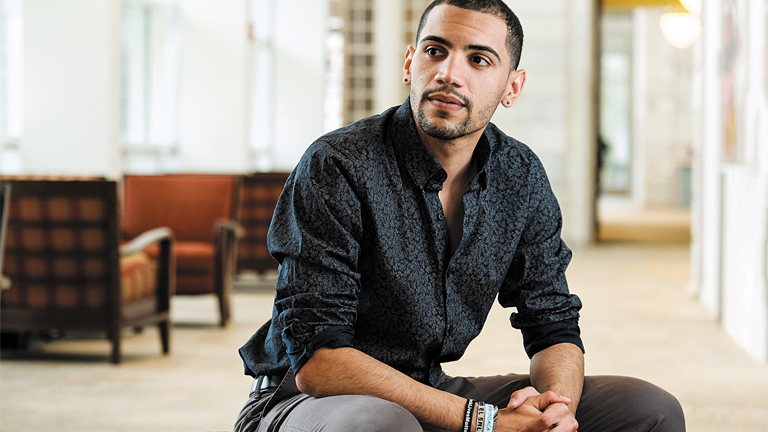 Victor Filpo ’16 moved around a lot as a child and young adult, living in the Dominican Republic, Puerto Rico, Florida, New Jersey, New York. He attended high school in New York City, earned a Posse Scholarship, and graduated from Middlebury in 2016 with a degree in Japanese studies. Now an admissions counselor, Filpo talks to Matt Jennings about being a person of color in America today. We’ve talked a bit off-the-record about how you grew up. You moved around a lot, there weren’t a lot of positive role models in your life, you were in a vulnerable place . . . I needed a place where I could safely be me. A liberal arts school was that place. Middlebury was that place. And then, instantly, I met my Posse class; and my Posse mentor, Deb Evans; and [Dean] Ann Hanson, who was also a Posse mentor. And I’ve been raised by this village. Was it difficult to adjust to life in Vermont? There’s a lot to like about Vermont. Now, there are aspects of rural living that are not convenient. I can’t walk outside at 11:00 p.m. and get Salvadoran food like I can in New York. You can’t do that at any time. [Laughs] True. Exactly. But more than the rural nature of Vermont, the biggest shock was the racial aspect. I was raised in the Caribbean and in areas of the U.S. where there have been a lot of Latino and black populations or black Latino populations. They’ve just surrounded me my whole life. So I hadn’t really thought about it until it was right in front of me: very few people look like me, have experienced things that I’ve experienced. I didn’t expect for race to be this massive of an issue. But here’s the thing: I strongly believe that Middlebury has given me the tools to better understand issues involving race and inequality and prejudice and injustice. Looking back on my life before I came to college, my community was not devoid of these issues; I just didn’t see it. But now I not only can see it, but I understand where it is coming from, and I better understand how to navigate this world. Of course. There’s an issue with “blackness” in the Dominican Republic, especially when considering the country’s relationship with Haiti. I remember a time in the second grade when we would rank the most beautiful people in our class, and it was always the light-skinned children who ranked the highest. There was an accepted correlation between attractiveness and light skin. And we just accepted that. Jump ahead to me sitting in a psychology classroom, and we’re learning about an experiment in which children are presented with dolls—one black and one white. And the kids overwhelmingly chose the white dolls, even the black kids did. It was just like my childhood. But now, I was learning why that was, I was learning the psychology behind it. And its not just beauty standards, but redlining, incarceration rates, vestiges of colonialism. The concept of race permeates daily aspects of life. I was learning why. Knowledge doesn’t always equal comfort . . . Knowledge can come with anger, it can come with sadness, it can come with feelings of betrayal. Does it have to be people who look like me, people who have these experiences? Everyone deals with it differently. But the commonality is, if you are someone who lives with a marginalized identity—and in some cases it’s a combination of marginalized identities and not just one—there are many spaces and interactions that can make you feel like you don’t belong. That said, I’m proud to be a person of color; I’m proud of who I am. I’ve learned how to be empathetic, and how not to other others. You’ve spoken about how we need to move beyond individual actions and expressions and toward a more collective position of support and understanding . . .
That hasn’t been easy for me to do. As a young person of color, speaking my mind can put me in a precarious position, but I am so heartened when people have told me how much it means to hear me say that. That’s the collective expression of support and understanding that Middlebury deserves. It’s that village, it’s an example of being a part of a community. I see people struggling—here and everywhere—and I want to fix that. I’ve struggled, too; Middlebury hasn’t been easy, but I’ve found people who care for me and love me, and it has been a formative experience that has made me stronger and smarter. I want that for everyone.